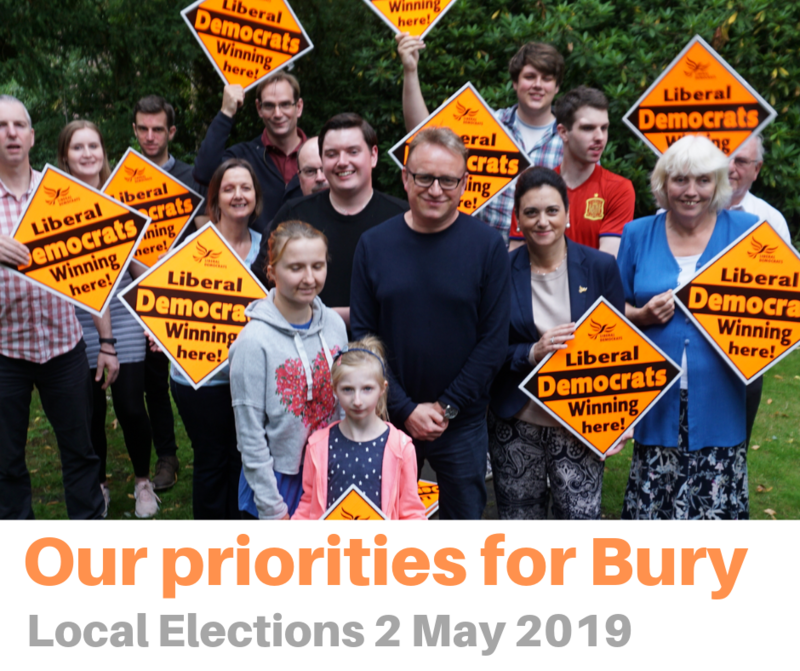 Bury Liberal Democrats have announced their key priorities for the local elections on 2 May 2019: Congestion and Air Pollution; Environment and Green Spaces and Safe and Strong Communities. Communities all over Bury suffer from congestion causing delays and increasing air pollution. Many secondary roads suffer from use as ‘rat runs’. Metrolink is a brilliant public transport option, but it is overcrowded and fares are going up well above inflation (19% over three years). Based on Transport for Greater Manchester’s own figrues, 1 in 8 passengers don’t buy a ticket. Campaign to immediately tackle the worst congestion hot-spots by reviewing traffic flow, traffic lights sequencing and shifting parking bays off main roads onto off-street parking. Propose a freeze on Metrolink fares, and instead tackle fare-evasion and passenger concerns over safety through the introduction of conductors on all trams – paid for by increased ticket sales. Campaign for increased capacity on the Metrolink by extending the ‘third tram’ (Trafford Centre line in 2021) to at least Whitefield, and eventually to Bury (currently this is proposed to terminate at Crumpsall). Tackle Air Pollution by introducing compulsory ‘no-idling’ zones around all of our schools and through prioritising newer low/zero emission buses in future bus company negotiations. Bury Council is proposing through the Greater Manchester Spatial Framework to build 6,000 homes on our precious green belt land, as well as destroying whole areas of green belt for industrial use. Bury is not doing enough to help our environment by reducing waste and increasing healthy green travel. Reject the current GMSF proposals and campaign for NO loss of green belt land. Focus on providing the affordable houses that local people need by building on existing brownfield sites, particularly bringing life back to our town centres. Move Bury to the forefront of developing healthy and green travel through the faster development of safe walking and cycling routes right across the Borough. Reduce the amount of waste that Bury produces by moving Greater Manchester, and Bury in particular, to being a place with less waste produced, through working with supermarkets and residents to reduce uneccessary waste. Everyone knows that the police are underfunded and it is not surprising that crime levels in many areas are increasing again. Greater Manchester Police have the worst record in the country for solving hate crimes in England. Spend 100% of the extra police funding delivered through the increase in Police Council Tax on visible front line policing and shift focus back to visible local policing. Provide extra police focus on solving hate crimes in our local communities. Immediately end the disgraceful use of 15 minute home care visits by Bury Council. Provide extra resources to enable our local schools to help increase support around mental health issues. Prioritise the development of local services to tackle acute lonliness, particularly among older people. Invest in our community groups and services and significantly increase the number of volunteering opportunities available. Ensure that the redevelopment of Prestwich Village only goes ahead after the views of local people are heard, and with the current level of community facilities as a minimum. Whilst I agree with your environmental policy what about Social care? It is disgrace . The lack of street cleaning in Sedgley Park has been a long-standing problem. When it comes to lowering crime rates, cleaning the streets has a positive effect and improves the environment for residents.. While I applaud your ambitions, no where have you mentioned the redevelopment of Radcliffe, this is a dying town with high crime and no high school, Prestwich is a vibrant town with 3 high schools and a MP that has ploughed money after money into it. So what about Radcliffe?